" Articles in Category: Google	"
On today's BradCast, I'm in for Brad and Des, dropping by from my own show, In Deep with Angie Coiro. Today's Rose Garden press conference was drenched in irony: a faltering, incoherent, angry man declaring a "national emergency", even as he demonstrated that he's the crisis. Donald Trump yelled at reporters to sit down, fell into sing-song whimsy, showed off his version of a Chinese accent, repeated phrases when he lost his train of thought, wielding terrifyingly grown-up powers with the gravitas of a toddler in a man's suit. Fortunately, enough roadblocks will be thrown down --- by Reps AOC and Castro, by Nancy Pelosi and Chuck Schumer, by the ACLU, and presumably by property owners along the proposed wall sites --- that he should be kept busy and irritated for some time. The taxpayer money wasted will be appalling. Republican former Massachusetts Governor Bill Weld appears willing to throw himself atop the bomb: he says he may primary Donald Trump. He minced no words -– I mean, he was stunningly straightforward -– in criticizing his fellow GOPers, who he said exhibit all the signs of Stockholm Syndrome(!). Someone needs to step up, he says. He even hints that he's willing to act as a spoiler to damage Trump in the general. Plus the latest on Facebook, Amazon, and what tech campuses have to offer their neighbors. Finally, my guest JOEL SIMON of the Committee to Protect Journalists. His new book, We Want To Negotiate, makes a compelling case that both the US and Britain need to re-examine their "we don't negotiate with terrorists" policies. His research puts the lie to a lot of assumptions, for example, that to pay ransoms will encourage more kidnappings. It makes sense on the face of it, but --- wrong. 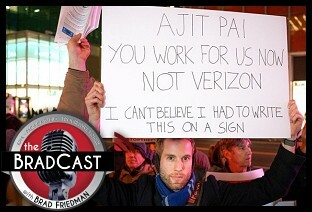 On today's BradCast, guest hosted by me, Angie Coiro – a passel of news and analysis as we wrap up the week. First, the latest updates on Michael Cohen's close personal buddies/clients, all of whom are running from him as fast as they can. AT&T’s internal memo (well, hardly internal now) cleaves every connection with him so surgically you can all but catch a whiff of smoke from the cauterization. But how much of what we’ve learned adds up to a breach of law? Another division – except this one is ongoing, long, and ragged: the gulf between Candidate Trump and his doppelganger occupying the White House. Said doppelganger detailed his new plan to get the price of medications under control. He took the usual opportunities to bash other countries (many of whom don’t have this problem), and President Barack Obama. What he didn’t do is consult Candidate Trump on what he’d promised on this same issue – which is missing from the new plan. Republicans inside and outside the White House have taken disturbing aim at a sadly vulnerable target: John McCain, of all people. McCain is inching toward the close of his life with terminal cancer. That’s joke fodder for a White House aide, responding to McCain’s opinion on Gina Haspel with “he’s dying anyway” (ha ha ha! No, not funny). His war record was fodder for appalling lies on Fox News. And his intentions for his own funeral – good lord, how do you criticize anyone for their own funeral plans? – met with snide disapproval from Orrin Hatch. Of course all three have apologized. For whatever that’s worth. After that, a quick look at the repeating pattern of the now-iconic Disillusioned Middle-American Trump Voter. And finally, a long conversation with political commentator and author Sally Kohn. Her book The Opposite of Hate explores breakdowns in society as massive as the Israeli/Palestinian divide and the Rwandan genocide. She met people who’ve slowly, tentatively built or rebuilt relationships severed by those political explosions. Maybe the most striking example: the woman who cheerfully sits down for tea with the man who murdered her family. Brad and Desi are back next time! First today, while Trump and the GOP have been banking on their deficit exploding tax cut to help mitigate their likely losses in the upcoming 2018 mid-term elections, they may need to come up with a Plan B, as new polling reveals the scheme is decreasing, rather than increasing in popularity since it's passage last December. That, as still more Republicans are running from Congress today, and even lobbyists turned White House officials are crawling back out of the swamp and back through the revolving door to get their corporate lobbying gigs back before it's too late. Even Trump's own stolen Supreme Court Justice Neil Gorsuch abandoned the President momentarily today, to join the Court's four liberals in striking strike down a law allowing the government to deport criminals for vaguely defined "violent crimes". But all of that may be of little moment to Trump today, as his own personal legal woes continue to mount each day at a seemingly ever increasing pace. Joining us to try and make sense of the fallout from the recent raid of Trump's "personal attorney" Michael Cohen and his bizarre federal court hearing on Monday, as well as where Special Counsel Robert Mueller's probe may (or may not) be heading at this point, is RANDALL D. ELIASON, former Assistant U.S. Attorney in D.C., George Washington University law professor, blogger, and Washington Post legal commentator. Eliason details why the case against Cohen is "much bigger than just some Stormy Daniels referral" and why the Trump attorney's argument hoping to prevent prosecutors from examining supposed attorney-client privileged documents is, along with the entire criminal probe of a sitting President, "so remarkable, and incredible, and unprecedented." "I mean, yesterday the lawyers for the head of the Executive Branch were in a federal courtroom arguing that the Department of Justice's own prosecutors can't be trusted to do a privilege review. Their own boss is in there arguing against them, basically, that they can't do this properly," Eliason tells me. "It is just unbelievable." He also explains precisely what "collusion" is and isn't; what "corrupt intent" actually means in a legal sense, as it relates to potential obstruction of justice felonies being investigated by Mueller; why it doesn't matter whether Mueller interviews Trump at all; and whether the Special Counsel may end up issuing an indictment of the President, rather than just a report that could be referred to Congress for impeachment consideration. First up, yet another media mega-merger is announced as Disney says they will purchase much of Rupert Murdoch's 21st Century Fox in a $52 billion dollar deal, even as Trump and the Congressional GOP push to give them all huge tax breaks --- at the expense of the poor and middle class. Republicans are hoping for final passage of their tax bill before Christmas and before presumptive Sen.-elect Doug Jones (D-AL) can be seated and further reduce the GOP's slim U.S. Senate majority. On the upside today, one of Trump's wildly inappropriate industry shills nominated to the EPA has reportedly withdrawn, as have two wholly unqualified nominees for lifetime judgeship appointments to the federal bench. Then, as expected on Thursday, Trump's Republican-led Federal Communications Commission (FCC), voted 3 to 2 along party lines to kill "Net Neutrality" rules for Internet Service Providers like AT&T, Verizon, Charter and Comcast. That, despite a letter from 18 state Attorneys General who asked the Commission to delay the vote until after a legitimate public comment period. The previous one, they charge, was manipulated by as many as 2,000,000 comments that New York's Attorney General Eric Schneiderman has found found to have been faked. Nonetheless, right-wing FCC Commissioner and former Verizon attorney Ajit Pai did not delay the vote, and the Commission voted to kill the rules that had long prevented ISP's from blocking or slowing down certain websites or apps, or charging more for access to them. Longtime media reform activist SUE WILSON joins us today and describes the latest actions by the FCC as little more than a move toward the end of free speech on the Internet. She argues that the move to kill Net Neutrality echoes the efforts to pass the Telecommunications Act of 1996, which was also sold by proponents at the time as a boon for competition and innovation that would result in more free speech over our public airwaves. Instead, the public radio waves have become the nearly exclusive domain of corporate right-wing political speech and propaganda in the 20 years since the measure was signed by President Bill Clinton. "They made a lot of promises, when they consolidated radio, that we would end up with a much more diverse speech for everybody," Wilson explains. 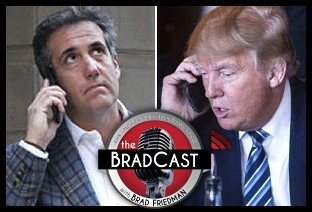 "Anybody who listens to radio knows that it's almost impossible to find a show like The BradCast on the air because it is now dominated by pro-Republican, conservative --- no, 'alt-right' --- speech, to the exclusion of all others. They flat-out lied to us, and guess what? That's what they're doing today." A similar future may soon be in store for the Internet, unless promised lawsuits or Congressional legislation is able to block or reverse today's shamefully under-reported and disturbing turn of events. "The claim that the Federal Communications Commission Republicans are making is that we need to give more money to broadband services so that they can invest in rural areas," says Wilson. "However, if you look at the Securities and Exchange [Commission] documents, which these corporations have to fill out --- under penalty of prosecution if they lie --- the six CEOs of publicly-traded broadband companies are telling their investors that the FCC's current Net Neutrality rules have not in any way impacted their investment strategies. Again, we're looking at the Federal Communications Commission, as headed by Ajit Pai, just making things up out of whole cloth." Yes, once again, according to several analyses, the disparities between Exit Polling and Election Results, as reported by unverified computer tabulators, suggest that one or the other of those two sets of data may be wrong. The first Exit Polls released by the media consortium on Election Night suggested that Hillary Clinton won in key battleground states, such as Wisconsin, Pennsylvania, Florida, Michigan and North Carolina, that she ended up reportedly losing. Figuring out what did or didn't happen, of course, remains very important. Had just about 50,000 votes across the three states of WI, PA and MI alone been recorded for Hillary Clinton instead of Donald Trump, she would be the President-Elect today. Dr. Jonathon Simon, author of CODE RED: Computerized Election Theft and The New American Century , and the man who originally documented almost identical disparities during the 2004 President Election, joins me to discuss his latest analysis of the still-continuing problem in 2016 and what needs to be done about it --- hopefully before the Electoral College meets to make it official by casting their votes next month. "There are huge disparities, way outside the margin of error, pretty much all in the same direction and, yeah, outcome reversing," he tells me. "So the question becomes, what do you believe? I'd be the first to say we're not going to prove anything with exit polls. But what we really have is two sets of really lousy evidence. We have exit polls --- you could ask, 'Why would you believe them?' --- and you have the vote counts. And you could also ask, 'Why would you believe them?' They're concealed, they're computerized, they're outsourced, they're privatized --- whoever is programming them has the basic control over how those votes are counted or how fictitious it could be. They're also subject to outsider hacking, as well as insider rigging." "Let me put it this way," Simon continues, "the question that I would want to put to anybody keeping score at home would be, 'What would Trump do?' If these same numbers came out, only they were reversed --- in a parallel universe, he won the popular vote, and Hillary Clinton won the Presidency and the electoral college, and there were all these states in which the exit polls favored Trump and somehow the vote counts favored Clinton --- you can bet your bottom dollar, based on what he said going into the election, based on the attitude he had about not conceding, about making sure if he felt there was any suspicion that he would challenge, that they would be challenging these results." But what of the response from Edison Research, the sole provider of Exit Polling data for the national media, that the methodology used for Exit Polling in U.S. elections, unlike polls designed for use in other countries, should not be used as an indication that the reported vote counts are fraudulent or otherwise in error? And why do these apparent "red shifts" in vote counts, as Simon describes the difference in the two data sets, tend to happen mostly to Democratic candidates (or, in the case of the Democratic Primary, to the more progressive candidate, Bernie Sanders) rather than to Republicans? Simon, a longtime election integrity advocate, and I discuss all of those questions and much more, including the real problem with this type of analysis between Exits and Results: the data that create both are still kept secret from public scrutiny, leaving everyone guessing --- and serving to further undermine U.S. democracy as a result. "The system is set up to be concealed, and the government and the media are working pretty hard to make sure it stays concealed," Simon explains. "And you've got a bunch of people with democracy in their hearts who are working just as hard, if not harder, to try to un-conceal it. It's an uphill battle, but that's what we're doing right now."